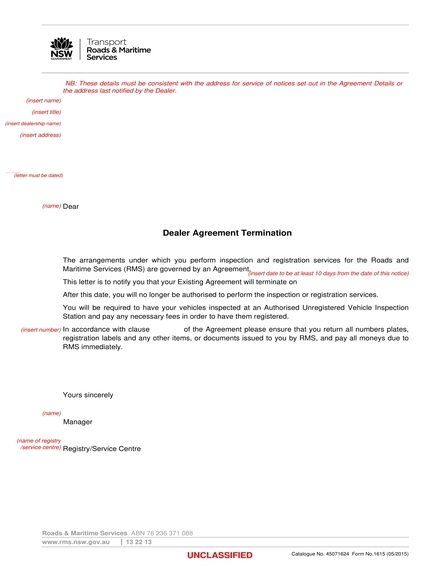 Creating a termination letter is both important and crucial in circumstances where you will terminate an agreement, discontinue your ties with an individual or a group, and if you wish to end transactions scoped by a contract due to valid reasons. 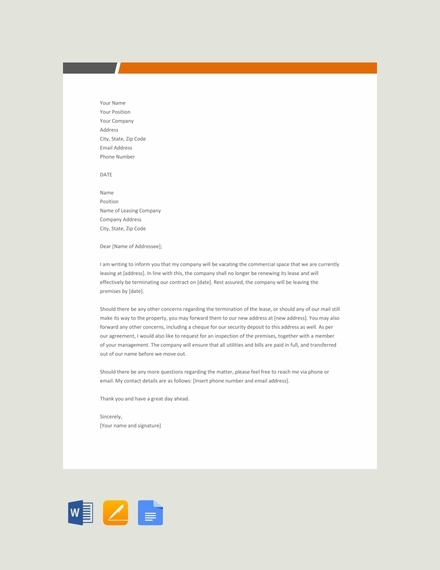 We have listed different kinds of termination letter examples and templates so that you can have a selection of references to use when creating the particular termination letter that your organization needs. 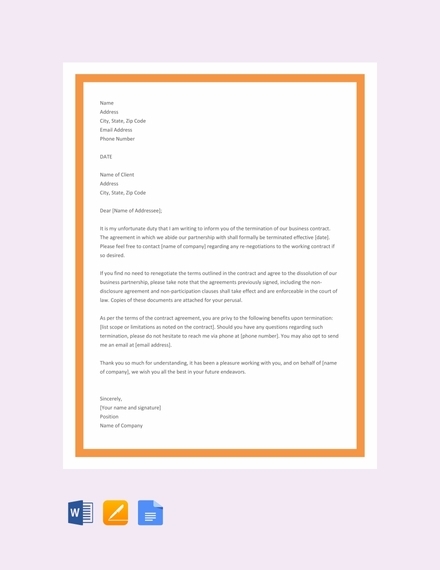 From a contract termination letter up to a partnership termination letter, there are a number of guidelines that you have to consider so you can make sure that you will create a highly functional document. 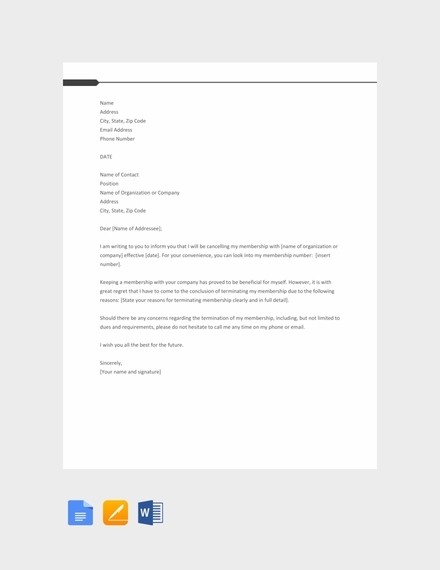 Aside from selecting the proper language and tone to use when writing the termination letter that you would like to provide to any entity, it is also essential for you to be knowledgeable of the elements that can impact the effectiveness of the document that you will make. Listed below are some of the elements that are essential to be observed in the termination letter that you will develop. 1. Ensure that you and your team will prepare for the termination by reviewing all the materials necessary for the decision to be backed up by facts. 2. 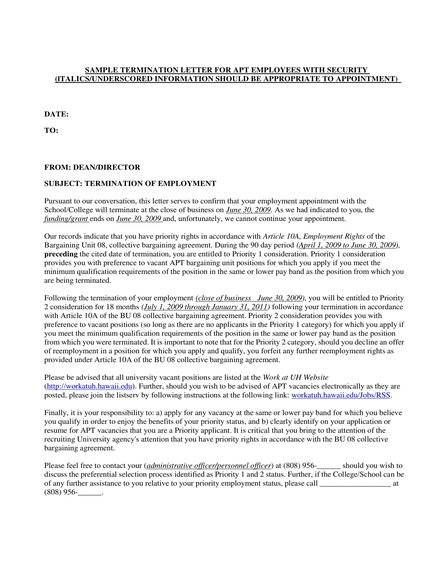 Have an outline of the information that are necessary to be included in your termination letter. 4. 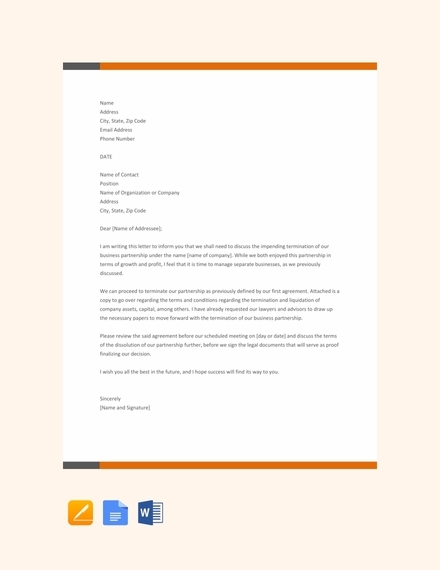 Once you have already listed the basics of the current situation as well as the purpose of the letter, ensure that you will elaborate the reason for the termination even further. 5. 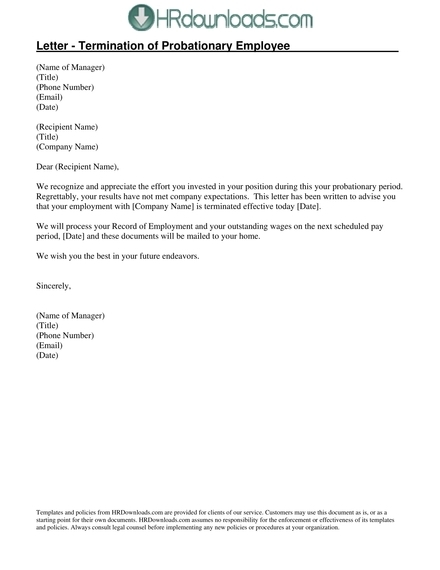 It will be best to your advantage if you will present facts and figures especially those that are related to the lead time given to the group or individual receiving the letter prior to the actual termination. 6. Discuss all the terms, conditions, and limitations of the termination. 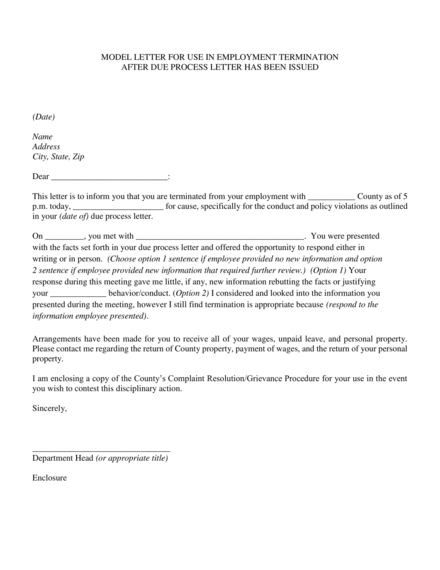 Your termination letter is expected to be brief, but you also have to ensure that it is complete, understandable, direct to the point, and accurate. 7. 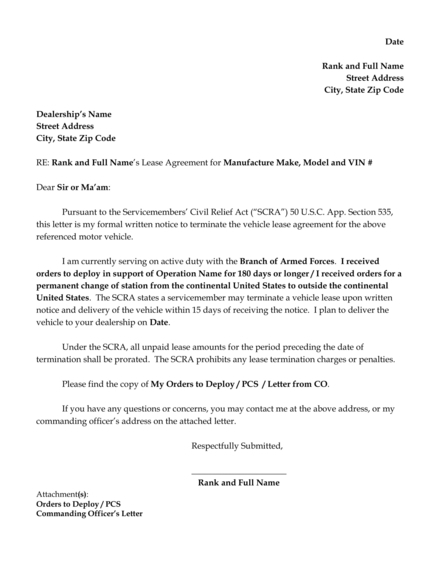 Finalize the draft that you have created and make sure that your discussion is already comprehensive and is relevant to the transaction where you will use the termination letter. 9. 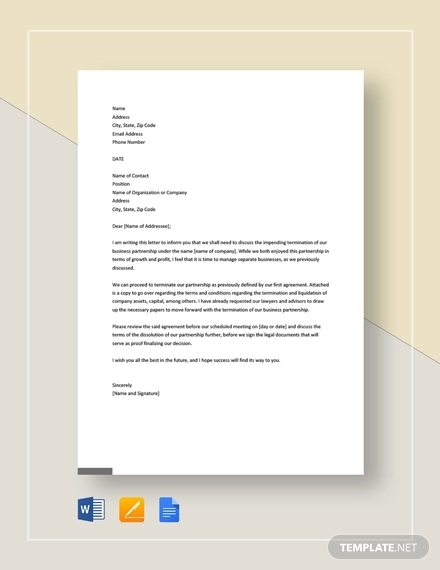 Place all the information in the chosen termination letter template and make changes and adjustments when necessary to make the document look polished and properly put together. 10. 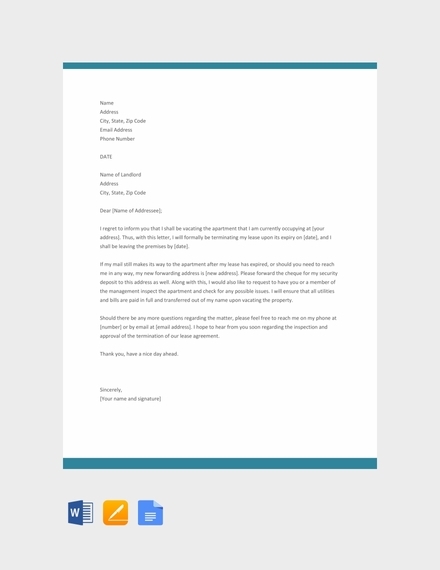 Browse through the entire document one or a few more times so you can make sure that there are no mistakes in the termination letter’s content, features, and format. 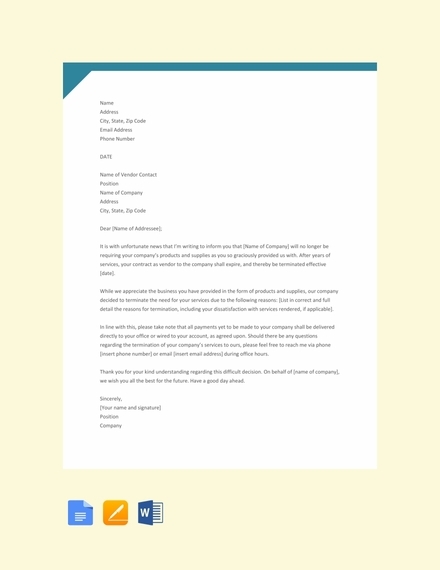 Give the responsibility of writing the termination letter to an individual who is aware of the basics of formal letter writing. 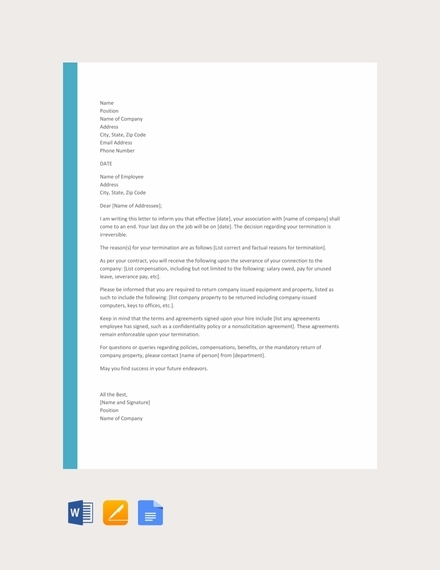 A termination letter, just like any other corporate documents, should present and reflect your business as well as its ethics, brand, and values accordingly. 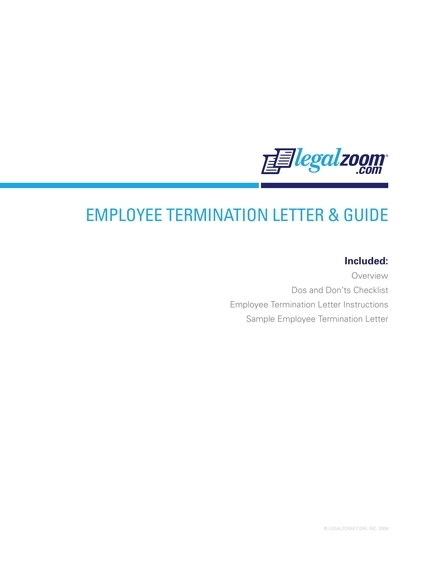 Make sure that the reason for the termination is clear and well-explained. You have to ensure that the termination letter is concise and precise so that lesser to no inquiries about the decision for termination will take place. Never forget to review the document before using it in actual undertakings. 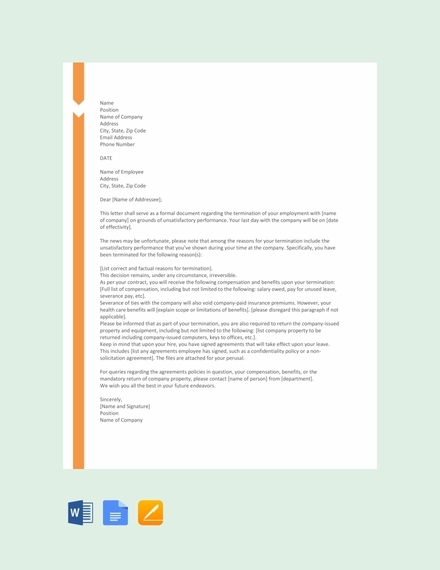 You and all the other entities who are allowed access to the termination letter content must evaluate the precision and accuracy of the document so that no misunderstanding can occur in the future once the document has already been given to its expected recipient. 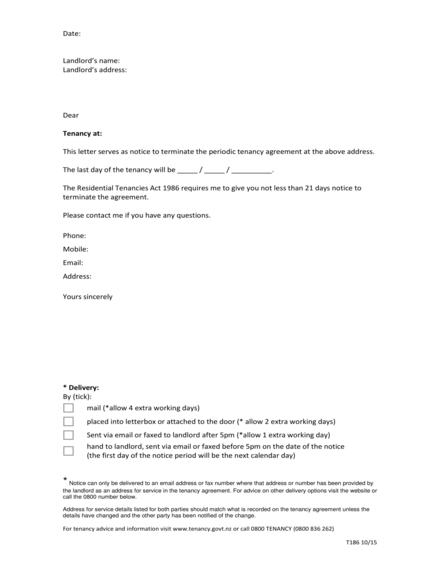 Is it really required for the reason for termination to be presented and discussed in the termination letter? 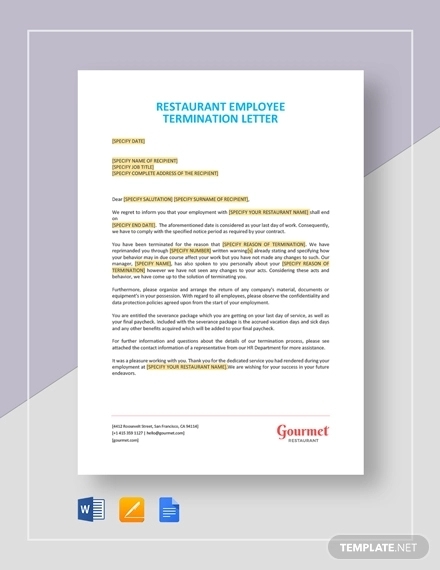 The termination letter should have a brief specification of the reason for termination. 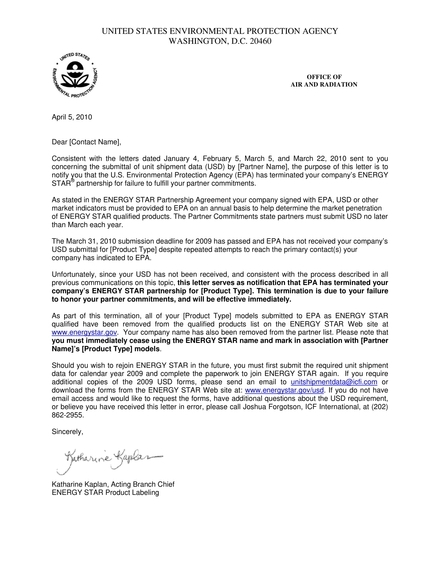 However, the discussion of the reason for termination is not always necessary especially if there is already a lead time given prior to the actual termination. 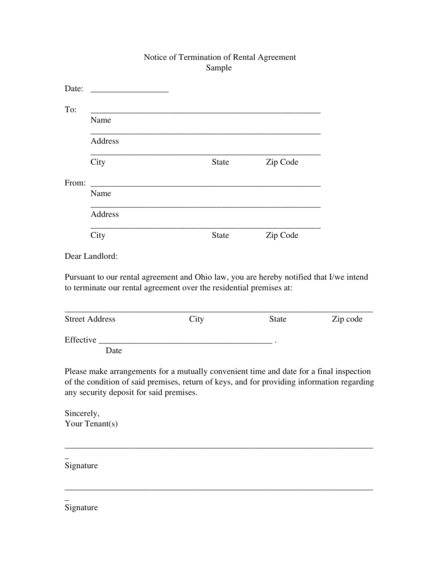 Always remember, that contracts and other forms of agreement must first be reviewed before doing the termination letter so that the document can validate the reason for termination. 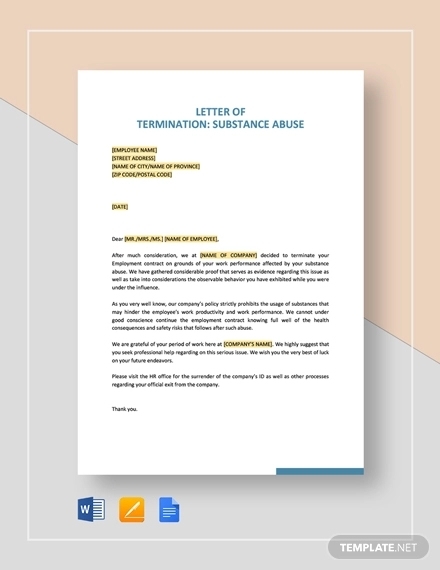 Why do you need to create a termination letter? 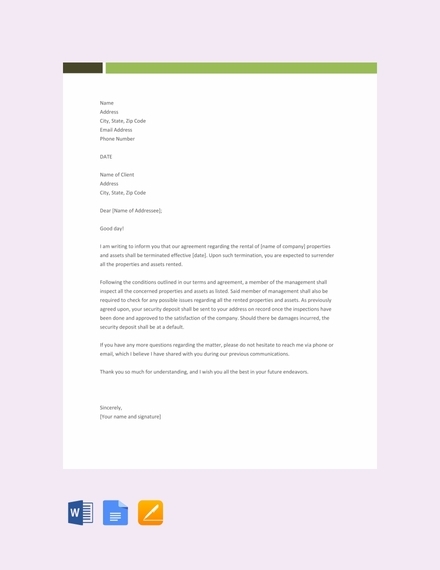 A termination letter reflects the formality of your business when ending transactions and/or business relationships. This is also a great way to ensure that there is understanding between all the parties within the transaction with regards the reason for the termination. 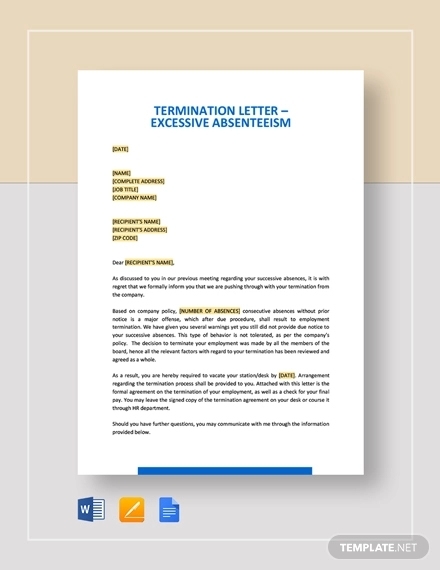 Having a termination letter can also provide specifications of important details related to the subject matter. 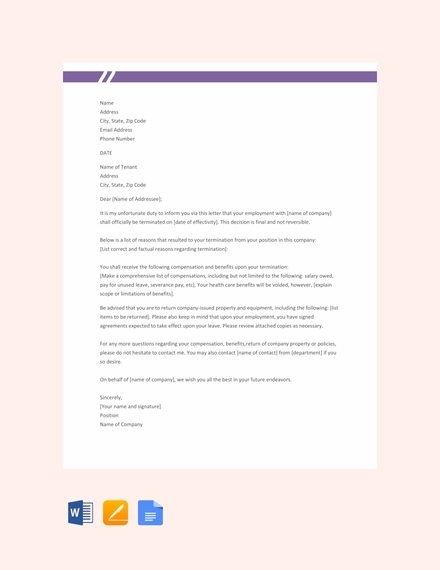 Just as how an official resignation letter is used by an employee to put an end to his or her connection with an employer, a termination letter is also used by entities to provide a notice pertaining to an end of a transaction or anything that links one party to another. 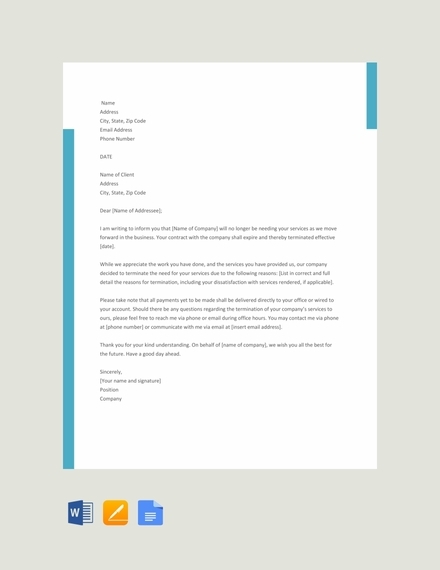 If you already want to create a specific termination letter, do not hesitate to download any of the references above.